When is it? Friday, Nov. 9, 2019 from 8:30 a.m.-2:30 p.m.
Where is it? The Fred Rogers Center at Saint Vincent College. What do I wear? Dress casual! Jeans and t-shirts are encouraged. Is there food? You&apos;ll be well-fed with a new-and-improved breakfast spread, an awesome lunch of soup, salad and pizza plus snacks available on your table. Is there coffee? All you can drink! Coffee service is available throughout the day. Are there prizes? You betcha. We&apos;ll have prizes and giveaways from Summit t-shirts to tech gadgets. Is there an after-party? We&apos;re working on it. Thank you to everyone who attended, presented at, sponsored and helped with the 7thannual Interactive Marketing Summit, brought to you by the Laurel Highlands Visitors Bureau! "Websites: Less is Necessary - The Art of Saying More with Less" presented by Nicholas Comanici, Marketing Strategist, Carney+Co. Download the 2016 Interactive Marketing Summit Event Program. Download the 2014 Interactive Marketing Summit Event Program. Post by Laurel Highlands Visitors Bureau. 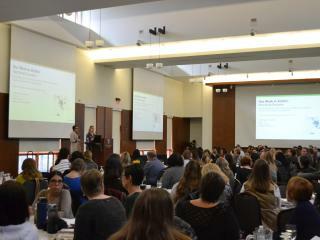 The 2013 Interactive Marketing Summit took place on Friday, November 8!